There are a myriad of details involved in building a studio, not to mention an entire facility. Getting everything down on paper before a single wire is pulled is one way to insure that a neat, logical, and orderly product ensues. For wire run documentation, I like to use Excel spreadsheet templates that I came up with. There are several different types of cable, from 25 pair ATT style, to 16 or 24 pair shielded audio cable, to miscellaneous control cable, all of it has different color codes. I found the Belden Technical info website to be an excellent source for various color codes. Doing neat work is best way to keep things in order. Notice all the wires are labeled. All the ground conductors have heatshrink, which is required on insulation displacement terminations like 66 blocks, 110 blocks and ICON terminations. Once all the work is done, the wire run sheets are updated with changes and additions (there are always changes and additions) which will keep the documentation accurate. I made up several templates with the wire color code, pair number and cable information on each wire. This allows the wire man to quickly enter changes to the wire information on the sheet. At the end of the wiring project, these forms can be saved in several places, printed out and placed in a book or however the engineering manager wants to keep the information. 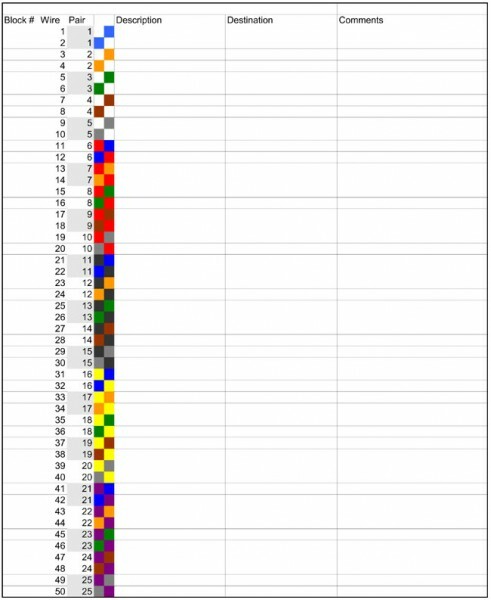 The excel spread sheet for this is here. For 16 pair Gepco cable on 66 blocks, click here. For 16/24 pair Gepco cable on ADC ICON Termination blocks, click here. I say Gepco cable, any audio cable that is color coded with standard resistor color codes will work with these sheets, or the sheets can be adapted for use with other cables. This is a good installation. The company I work for has several wiremen that are artists and do excellent work. Notice there is adequate room and light to work on the wall. 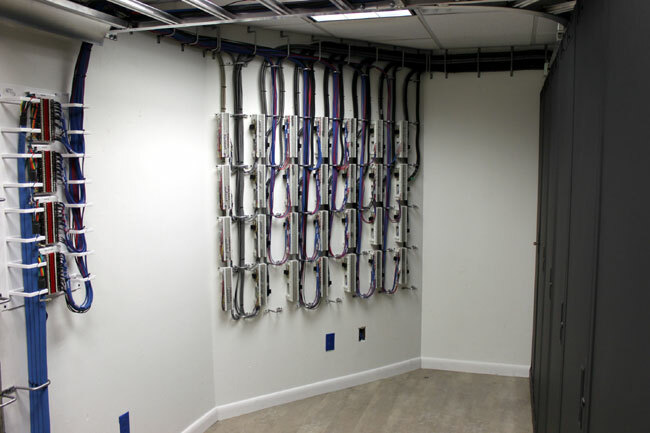 A dark, cramped area will lead to hurried work, poor workmanship, and mistakes in wiring. 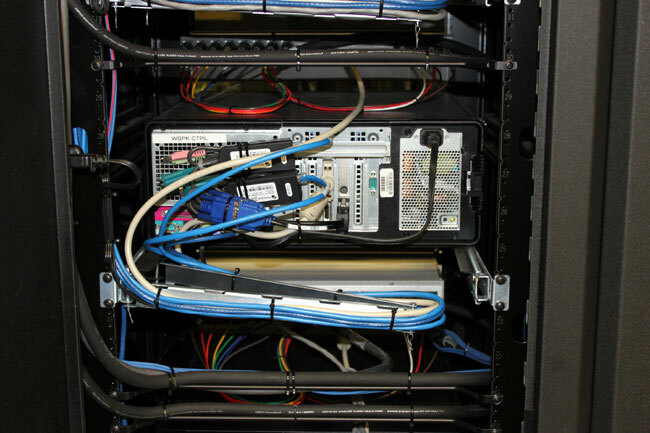 All the cables to the rack mount computers are neatly dressed, which allows easier service.